Italian third division team Pro Piacenza have been thrown out of the league after fielding just seven players in a 20-0 defeat on Sunday. 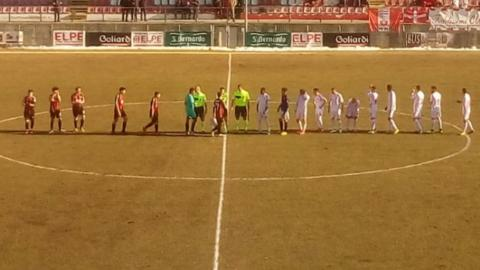 All seven players to face Cuneo were teenagers, with captain Nicola Cirigliano, 18, doubling up as manager. Prior to Sunday's match they had failed to fulfil three successive fixtures. The club, who are in serious financial trouble and were bottom of Serie C Group A, have been unable to pay their players and staff. An eighth player could not start Sunday's match having forgotten his identity papers, and the team's physiotherapist came on a substitute. On Monday, the league's governing body ruled some of the players were not registered and disqualified the team from the competition, handing Cuneo a 3-0 walkover. Lega Pro also fined Pro Piacenza 20,000 euros (£17,500), criticising the club's "unacceptable behaviour" and describing the match as a "farce" and "dangerous"
The Italian Football Federation (FIGC) said club affiliation had been revoked because of "serious regulatory violations that occurred at the Cuneo-Pro Piacenza match, in addition to the numerous other documented irregularities".